I recently discovered another wonderful photo challenge called Bench Series hosted by Jude at Travel Words. After coming across this photo challenge last week, I had planned this post for today, and literally posed my two dogs on this bench. My talented, carpenter hubby built and re-purposed wood planks from old softball diamond backstops into a bench which sits in our backyard. While at Lake Tahoe over the weekend, knowing I was going to take another bench photo, I was excited and ready to capture the very cool bench. As we walked around in the rain, we had trouble locating the bench. My hubby walked into the store near where the bench was last seen and was told that it was out for repair. Why did I care? It was a bench with life-sized figures of John Belushi and Dan Aykroyd posed as the Blues Brothers. I had it all set up…in my mind. I’m not comfortable posting someone else’s photo, so here is the website for Up Shirt Creek in South Lake Tahoe, if you would like to take a look at their photo. Not to be deterred, I quickly found another bench and, yes, I posed some leaves on it. Sad for my rookie attempt at this challenge, but it turned out OK. I think I was just ecstatic to have some rain to photograph, let alone some autumn leaves! Terri, thanks for putting the Pin to this post in The Pinterest Game, it could be a winner. You are amazing! Never gives up and delivers wonderful tales and images! Love it. Oh, now you’re making me blush, Lucile! Thank you! 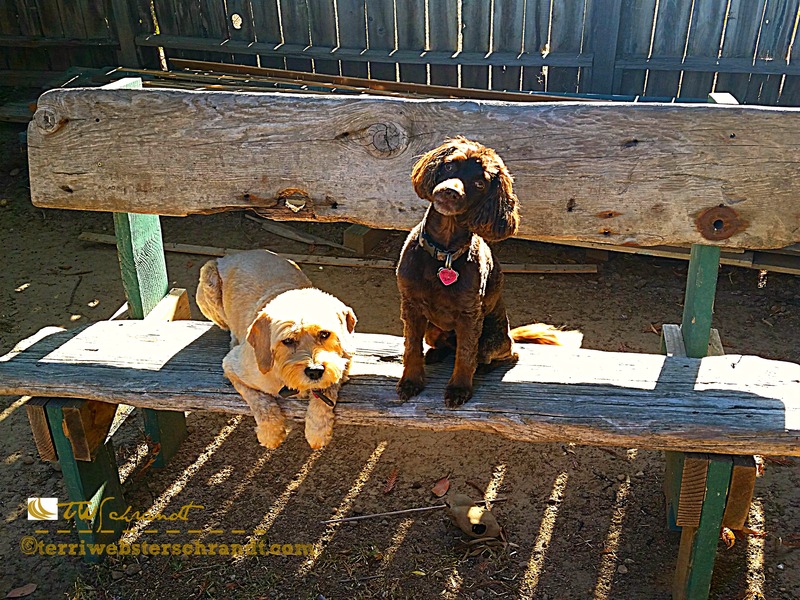 I really like the photo with the pups on the lovely bench that your hubby built. The shadows are great and the pups are adorable. I am sorry that you missed out on the Jake and Elwood bench. I did click through to see it on Up Shirt Creek and now I want to go there. Enjoy your autumn and your rain! Thanks, Lisa! That darn bench has always been there, and the one time I really want to see it, it ain’t there. It is a very cool thing to see. Supposed to get rain in our area next week. Always nice to hear from you! Well! Congrats on your one year anniversary. Hope blogging has been a wonderful experience. Cutie pie pups! Love their expression and great bench too, btw! Hmm, indeed hooray for the rain, just hoping not too much like what happened with the mudslides near LA last week. Such scary footage I saw on TV! Sending you all my very best for a very happy Tuesday, my friend! Happy Tuesday, Lia!! Thank you! If the predictions are true, Nor Cal should get a lot of rain, but we really need snow in the Sierras. Luckily Sacramento is so flat, the mudslides would be unlikely (keeping fingers crossed). Have a wonderful day, girlfriend! Fingers crossed that snow will arrive in the Sierras and everything else goes well this winter ! Hope you had a great Tuesday !! I love your dogs!! Perfect posers they are too! 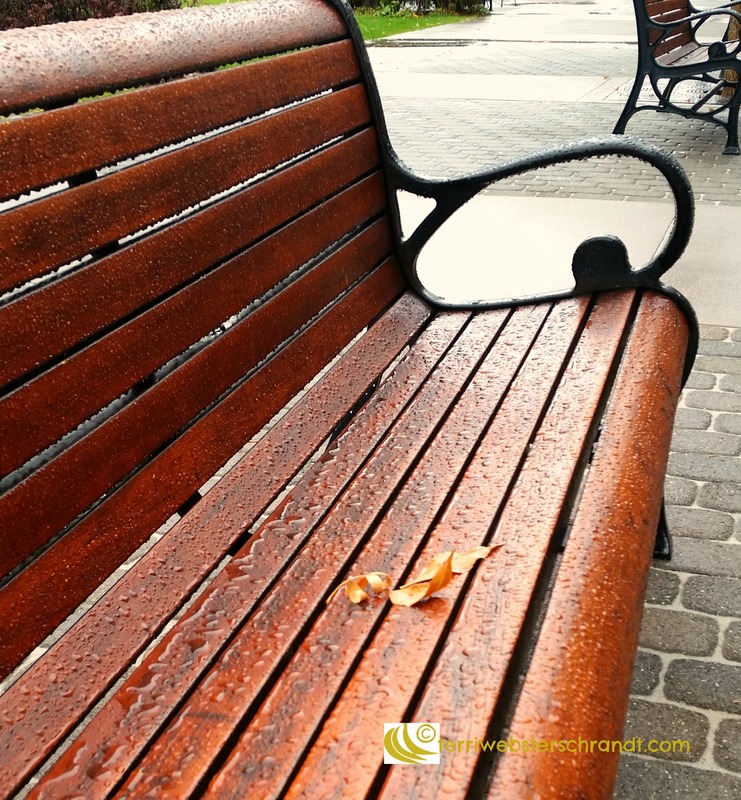 Leaves and rain on a bench are a wonderful combination-hope the rain isn’t affecting that knee of yours! Oh thank you! Luckily my knee really loved the steroid shot, so it’s not so stiff or swollen! I really like your photo of the bench with the rain. Good call to add the leaves. Love the juxtaposition of the rough bench with the smooth texture of the dogs’ coats. And the play of the light and shadows. Good eyeballs, there Melinda! Thanks! I had noticed the shadows but not their coats. I like your two cuties! It is wonderful having a carpenter around the house! Thank you, Jude! I love interesting photo challenges! Your husband is very creative and handy, and looks like your dogs enjoy it too – they are so adorable!